and Jefjen Schoonhoven. Abraham died January 3, 1792 and Maria died March 3, 1795. Elizabeth LeFevre - born October 2, 1717. Died before 1744. Blanshan. She was baptized on March 1, 1719. Gertrude Bruyn) on October 25, 1745. 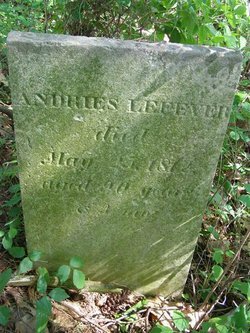 Andries died May 25, 1812 at age 90. Ulster County, New York. He died at age 90.